Carrie Lane Chapman Catt – an 1880 graduate of Iowa State University and a leader of the U.S. women’s suffrage movement – was one of four women selected in the first group of honorees for the Iowa Women of Achievement Bridge in Des Moines. The dedication of the bridge – which recognizes Iowa women from history who have made outstanding contributions, achieved prominence or advanced the well-being of fellow citizens in Iowa and/or the world – was held on Oct. 7 at the HubSpot on the Principal Riverwalk in Des Moines. The names of the honorees are showcased on commemorative plaques that are displayed permanently on the Iowa Women of Achievement Bridge, which spans the Des Moines River as part of the Riverwalk. The other women honored with Catt were Louise Rosenfield Noun, a philanthropist, civil rights activist and patron of the arts; Sister Bernadine Pieper, a nationally renowned scientist and educator; and Gertrude Elzora Durden Rush, the first African-American woman to practice law in the state of Iowa. Catt was nominated for the honor by Iowa State President Steven Leath and Dianne Bystrom, director of the Carrie Chapman Catt Center for Women and Politics. Letters of support were provided by Elizabeth Hoffman, ISU professor of economics, who served as dean of the College of Liberal Arts and Sciences during the fundraising campaign to renovate and dedicate Carrie Chapman Catt Hall; Jane Cox, ISU professor of theatre, who wrote and performs “The Yellow Rose of Suffrage” play about Catt’s life and legacy; Tim Lane, Catt’s great-grandnephew; Bonnie Pitz, president of the League of Women Voters (LWV) of Iowa and Linda Murken, president of the Ames LWV; and Sharon Rodine, an Iowa State alumna who was instrumental in the creation of the Carrie Chapman Catt Center and renovation of Catt Hall on ISU’s central campus. Bystrom, Hoffman, Lane and Pitz attended the dedication ceremony on Oct. 7 in Des Moines. The selection committee – Joy Corning, former lieutenant governor; Michael Gartner, former president of the Iowa Board of Regents; Mary O'Keefe, chair of the Riverfront Development Authority; Sally Pederson, former lieutenant governor; and San Wong, director of the Iowa Department of Human Rights – noted the outstanding quantity and quality of the nominees for the first year of the program. "The selection committee had a very difficult task limiting the number of honorees to four. Iowa has certainly produced a significant group of women who have left an indelible mark because of their enormous contributions," O'Keefe said. “This year's honorees defied the odds and advanced important causes for women and men of all races, creeds and economic levels. Their work established lasting institutions, laws and programs that today continue to serve Iowans and citizens of the world." 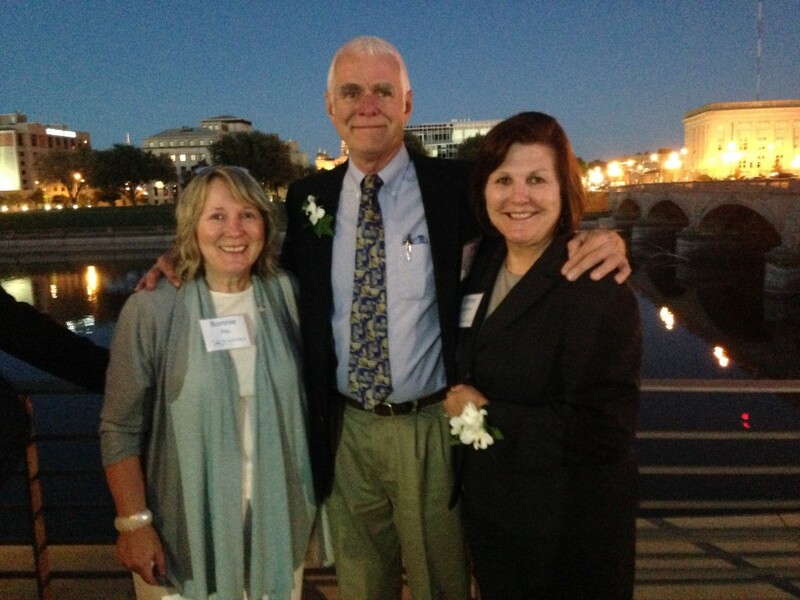 Bonnie Pitz (left), Tim Lane and Dianne Bystrom attended the dedication ceremony. In nominating Catt for the award, Leath and Bystrom noted that her “superior oratory and organizational skills are credited for winning the right to vote for millions of women in the United States.” Catt devoted 33 years to the suffrage movement, serving twice as president of the National American Woman Suffrage Association, including the final, successful campaign that led to the ratification of the 19th Amendment to the U.S. Constitution granting women the right to vote in 1920. Daisies were handed out during the dedication ceremony. 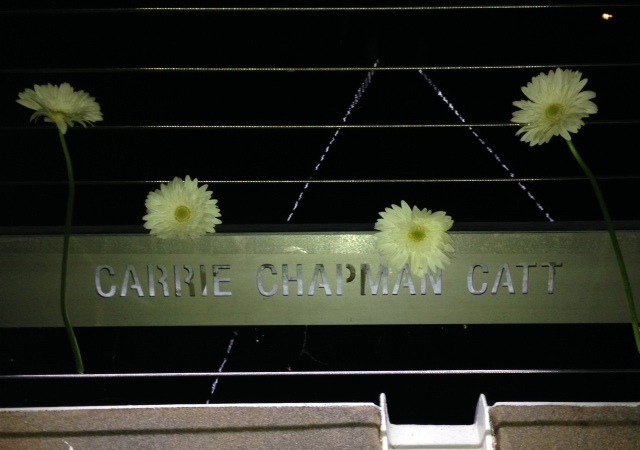 Bystrom and others in support of Catt decorated her nameplate before tossing them into the Des Moines River. 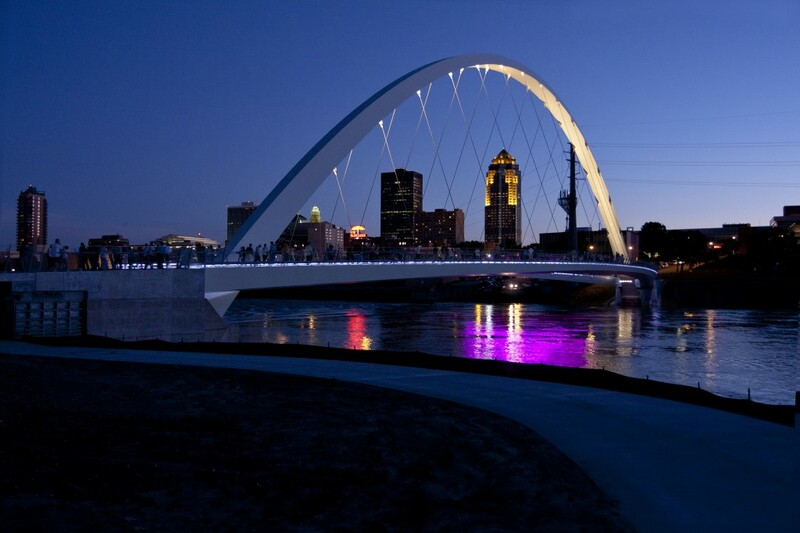 In addition to the Iowa Women of Achievement Bridge, the Principal Riverwalk – a gift to the city of Des Moines in celebration of the 125th anniversary of the Principal Financial Group – includes a series of walking paths that connect the east and west sides of the city. The project also serves as a hub for the city’s numerous bike trails. The 1.2 mile loop anchors four major attractions in downtown Des Moines – the Botanical Center, the Court Avenue District, the Science Center of Iowa and the Iowa Events Center.